CSCU President Mark Ojakian is pressing forward with his plans to consolidate the community colleges into one college. Lawmakers had sharp comments and questions for Connecticut State Colleges and Universities President Mark Ojakian Tuesday in a five-hour long forum on his controversial plan to consolidate the state’s 12 community colleges. experience for students and strengthen graduation and retention rates. Ojakian said the plan is bold and could be considered “a national model.” Accreditors have said they know of no other attempt to merge so many colleges. But some legislators, as well as professors and former college administrators who spoke at the forum, had their doubts about the plan. Ojakian and his staff expect that when the 12 community colleges are consolidated into one state college — in 2023, if all goes as planned — the annual savings will be $23 million. They also expect to save $11 million through an administrative consolidation that affects all 17 institutions in the CSCU system, including the state’s four regional universities and Charter Oak State College. Ojakian has said the savings will be invested in academics and services for students, such as hiring more student advisers. Barbara Brittingham, president of the New England Commission of Higher Education, the accrediting body for the CSCU system, was also present at the event and talked with legislators about the accreditation process. The commission did offer CSCU the chance to pursue the plan as if it were applying as a new institution — rather than making a “substantive” change in an existing one — but Ojakian said at that time that this would have taken five years, during which time the institutions would have become financially insolvent. Nine CSCU staff members also spoke at the forum, detailing efforts now underway to guide students toward a coherent and successful academic pathway and explaining complications associated with taking classes at two or more colleges or transferring to another community college. Michael Buccilli, who is a “Guided Pathways Manager” for students at Gateway Community College, outlined 35 steps that a student might have to take if she wanted to attend both Gateway and Housatonic community colleges simultaneously. She also said it must be possible for “very competent people” to figure out how to fix the 35-step issue without having to consolidate the 12 colleges. Ken Klucznik, who is manager of the CSCU’s transfer and articulation policy, said that while it may have gone smoothly for Wood’s friend, it’s likely that a lot of staff time was spent behind the scenes dealing with the complicated paperwork that is necessary to transfer. “Wouldn’t that time be better spent advising that student in a meaningful way, rather than pushing papers?” Klucznik asked. If the 12-college system were only one college, students could far more easily move from one campus to another, CSCU staff said. 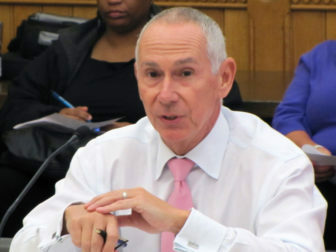 Wood also asked Ojakian why he was “speeding ahead with the hiring of three regional presidents” who would be needed to implement the proposed one-college plan. Finalists have been named for the regional president positions and hires are expected to be made in April. Brittingham noted that CSCU representatives will be meeting with NECHE in April to get an advisory opinion on how the plan is progressing. Later during the forum, professors and former college administrators spoke out strongly against the plan. Earlier this month, more than 1,300 faculty, students and former administrators signed a petition opposing the merger. Matthew Warshauer, a professor of history at Central Connecticut State University, told legislators that it was “flabbergasting” that Ojakian was promoting Students First as primarily a way to improve student experience rather than chiefly as a cost-saving measure, as seemed to have been the case in the past. Earlier this month, the higher education committee unanimously passed a bill that would enable lawmakers to stop plans to merge the state’s 12 community colleges into a single statewide institution. As it stands now, the regents make the decision on whether to close or merge institutions. The bill would require that any proposed merger or closing of a CSCU institution be approved by a majority of both chambers of the General Assembly. Ojakian has opposed the bill saying it politicizes such steps. Flexer said after the forum that she remains opposed to the consolidation plan.